Played with verve and enthusiasm, this was a colourful, enjoyable production. Described as a novel of manners, Jane Austen’s original work has been going strong since 1813 and has had many film, theatre and television adaptations. Reduced to basics, it is about young women seeking husbands with large fortunes and men seeking women who will make ‘suitable’ wives. 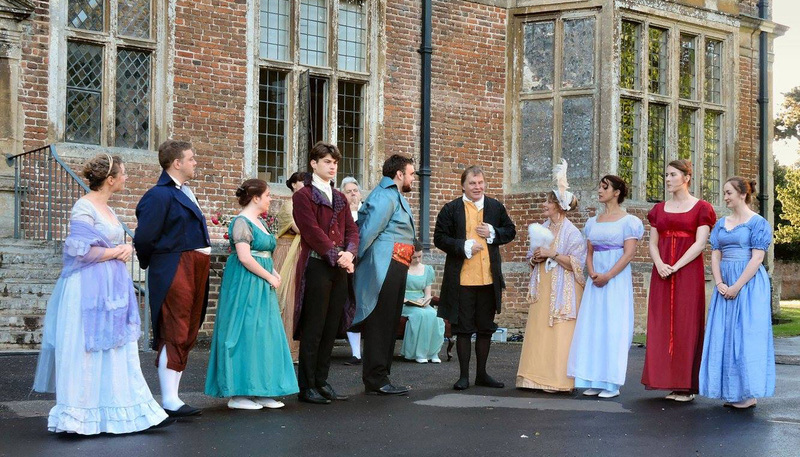 That said, its popularity endures through the ages and this most recent, ambitious outdoor production at Shaw House was very well staged. 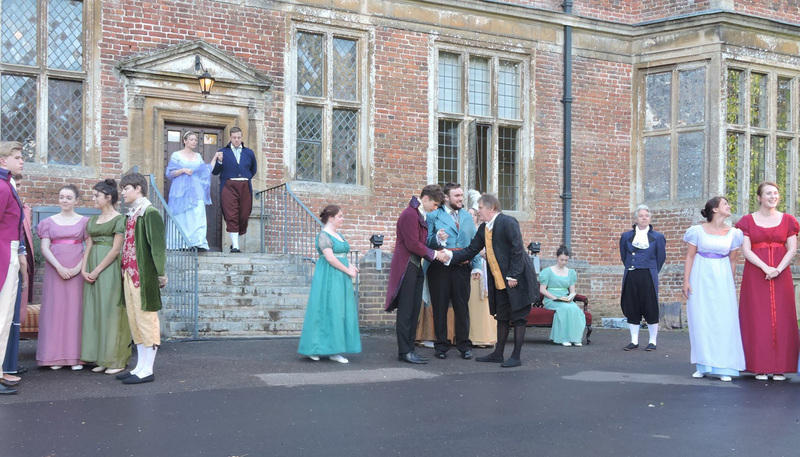 Well, not quite, because there was no stage as such but the movement across the front of the Tudor house terrace was achieved smoothly and very well timed, with actors appearing on stage, occasionally as if by magic, and picking up cues with hardly a pause. Full marks for the choreography, with some fine dance sequences, and indeed for the overall direction of movement and continuity by director Lisa Harrington. The costumes were colourful and authentic and the sound set-up allowed us to hear every word clearly, even if that included breathing noises. It did help also to make it clear when people were dozing off in chairs when they were supposed to be wide awake and taking serious notice of the latest marriage plans. 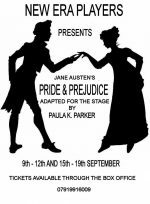 The acting and overall movement was very good from a large cast and even stage hands shifting furniture were dressed in Regency clothing. Of the main characters, Mr Bennett was played by David Tute with attention to his sometimes irresolute nature and Karen Ashby did well as the fussy, social-climbing, but rather ordinary Mrs Bennett. Pippa Higgins played the proud, indomitable Elizabeth with skill and sensitivity although the ‘laugh in the voice’ did become irritating after a time. 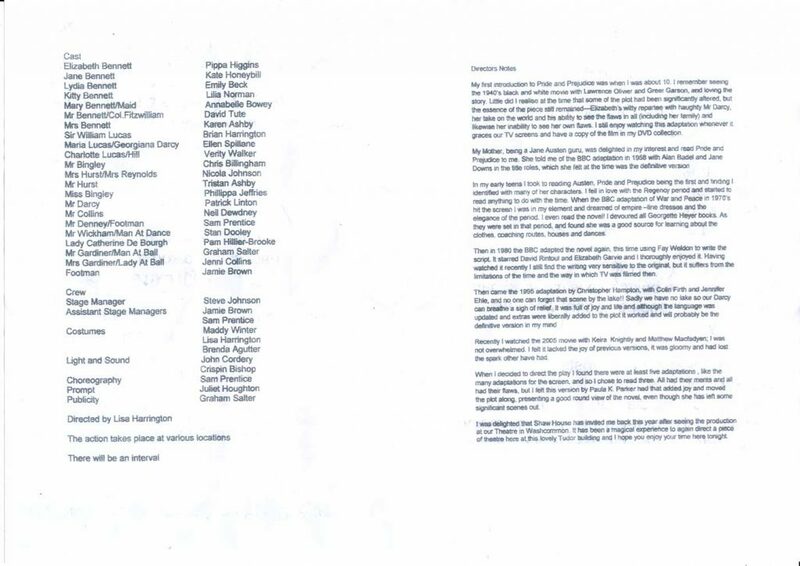 Not as irritating as Neil Dewdney as Mr Collins though, whose high frequency, fancy speech was accurate enough, except that it was all on one level and had no variation of pitch whatsoever. 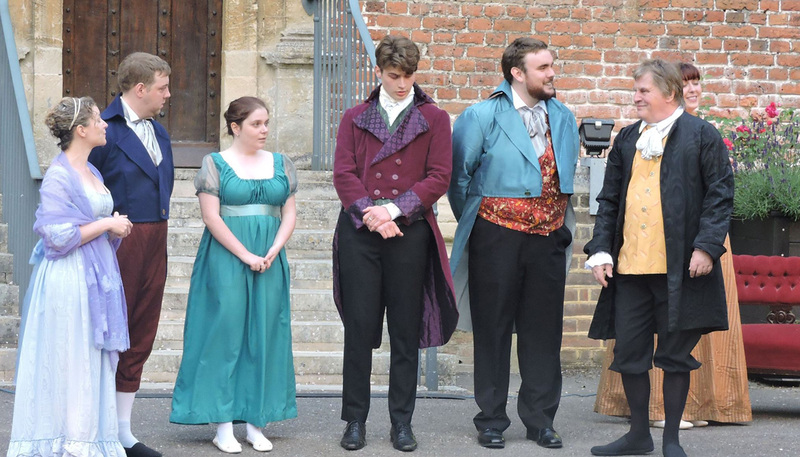 He did convince in his character though and there were good cameos from Pam Hillier-Brooke as the pompous, condescending Lady Catherine and Chris Billingham as Mr Bingley. Patrick Linton was a believable Mr Darcy, who managed to avoid the lake throughout. Played with verve and enthusiasm by all, this was a colourful, enjoyable production. 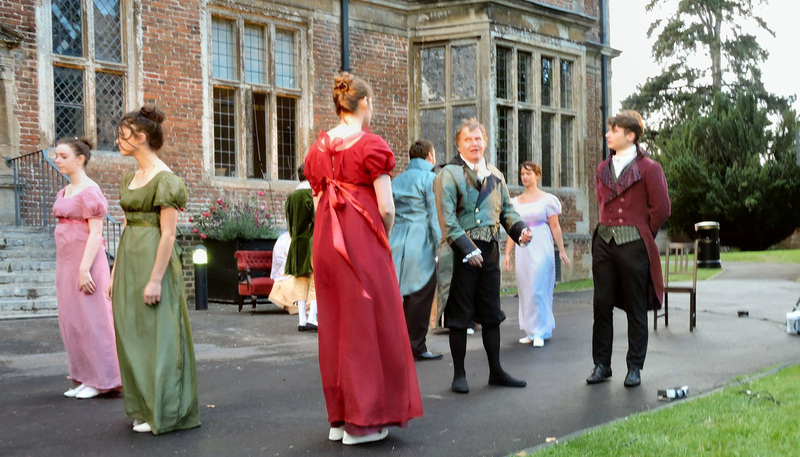 Following their successful A Midsummer Nights Dream, New Era Players have been asked back to Shaw House this summer to perform Pride and Prejudice. The show dates are 30th June and 1st and 2nd July and the audience are welcome to arrive at the venue for a picnic on the lawn from 6.30 pm. The show will start at 7.30 pm. Bring blankets and chairs to sit on and, to just make sure you are warm, something to keep out the night air.